The 75th Ranger Regiment, composed of three Ranger battalions (1st, 2nd and 3rd), is the premier light-infantry unit of the United States Army, part of the army's Special Operations Command. Considered the masters of special light infantry operations the Rangers' expertise is in attack missions to temporarily seize and secure key objectives and other operations requiring unique capabilities. They are trained to infiltrate by land, sea, or air. Headquartered at Fort Benning, Georgia, the Rangers' history dates back to World War II, when the 1st Ranger Battalion (Darby's Rangers) fought throughout Western Europe and achieved its greatest fame when it scaled the cliffs of Normandy as part of the D-Day invasion. After the war, the Rangers had an irregular, often interrupted, role in the Army. They were deactivated in 1945, but were recommissioned in 1950 when seven companies saw action in the Korean War. They remained out of action for the rest of the 50s and much of the 60s until they were reactivated under the 75th Infantry Regiment. Ranger companies were sent to Vietnam, where they fought mainly as Long-Range Reconnaissance Patrols (LRRPs). 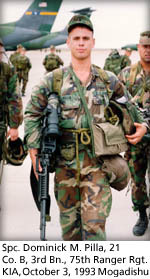 In addition to Task Force Ranger's mission in Somalia, the Rangers have played major roles in a number of operations throughout the '80s and '90s. In 1983, Rangers led the assault on Grenada, jumping 500 feet to capture the Point Salinas airstrip. In Panama, they stormed the main airfield at Tocumen in the dark, paving the way for the airborne operations of the 82nd Airborne Division. At Rio Hato, they jumped 400 feet into enemy gunfire to neutralize Panamanian forces based at the airfield. And a Ranger battalion performed a number of missions in the Persian Gulf that are still classified. Today, the army maintains the Regiment at a constant state of readiness. Each battalion can deploy anywhere in the world within 11 hours of notice. To maintain readiness, Rangers are constantly training. Their training encompasses arctic, jungle, desert, and mountain operations, as well as amphibious instruction. The training philosophy emphasizes tough standards and focuses on realism and live-fire exercises. Rangers are also required to train at night, during adverse weather, and on difficult terrain in order to be prepared for a variety of situations. Throughout their training, Rangers are taught to expect the unexpected. All officers and enlisted soldiers in the Regiment are volunteers. Those volunteers selected for the Regiment must meet tough physical, mental and moral criteria. Upon assignment to the Regiment, both officers and senior NCOs attend the Ranger Orientation Program (ROP) in order to familiarize themselves with Ranger policies and operating procedures. Enlisted soldiers assigned to the Regiment go through the Ranger Indoctrination Program (RIP) where their physical capabilities are assessed and they are indoctrinated in basic Ranger standards and philosophy. Soldiers who do not pass ROP or RIP are transferred from the Regiment. Each Ranger battalion has 580 personnel assigned to three rifle companies and a headquarters company. The rifle companies consist of 152 Rangers each, while the headquarters company comprises the remaining Rangers. Ranger battalions are light infantry and have only a few vehicles and crew-served weapons systems.